Straight A’s were the norm and then in sixth grade the allure of politics called. Stefanik ran for student council president, revealing, at an early age, her gift for knowing what people wanted and how to get it. “My campaign was a promise to bring in a snack machine, which we didn’t have at the school,” she recalls with a smile. After forming an unstoppable coalition between the sixth- and eighth-graders, she won her election and kept her promise, securing the vending machine. First rule in politics—when in doubt, give them corn chips. 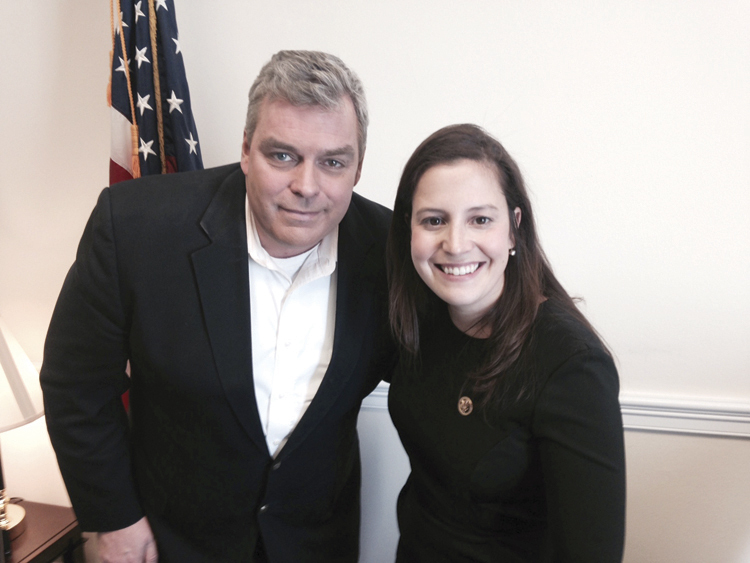 While she didn’t help launch the page, Stefanik did see the power of social media to connect with people. After graduation (and a stint working in the Bush administration and others), she used it well when she ran for Congress last year. I won’t bore you with the minutia of her campaign, only to say that she impressed those who gave her a chance, shocked those who did not, and when the votes were counted nobody was saying “Elise who?” anymore. These days, five months into the job, she’s greeted with a smile and navigates the hallways and tunnels under the Capitol with the ease of a veteran, speed of a teenager, and guile of a woman with some place to be. In the red state-blue state reality we live in, where people can’t agree on the beauty of a sunny day, Stefanik is trying to change the very landscape and culture in Washington. Impossible? Someone who knows her well told me they may not agree with Elise politically on everything but they believe in her and that’s why she won. That’s how she made history. If you look at what she’s accomplished so far, so fast, starting with that snack machine, she may just be the first politician in history who is, as they say, all that and a bag of chips.